Lap runs on the Nürburgring Nordschleife in Germany’s Eifel region are often cancelled due to rain. 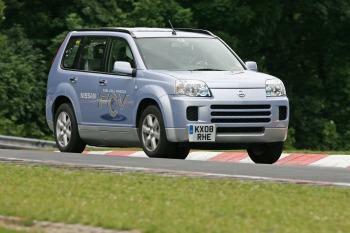 But the wet weather didn’t stop Nissan from taking its X-Trail fuel cell vehicle for a spin on the course recently, making Nissan the first automaker to record an FCV lap on the famous race track. Frank Eickholt, member of the Nissan 24 Hours Nürburgring race team and Nordschleife aficionado, skilfully steered the 1.3 million euro prototype through ‘The Green Hell’ – as the course is often referred to – on standard street tyres. And although the 20.8 kilometre-long course was consistently wet – making it difficult to drive aggressively – Eickholt was impressed with the X-Trail FCV which clocked in at 11:58 minutes. “I was very surprised at just how comfortable it is to drive a fuel cell car. You get in, turn the key and off you go, just like with a normal car,” said Eickholt. “Although some of the uphill sections were challenging, the speed was still very impressive. If the course hadn’t been so wet, I could have gotten more momentum out of the curves. Thirty to 40 seconds could have been shaved off for sure,” he added. The five-seater X-Trail FCV is a zero-emission electric vehicle that runs in near silence. It is powered by electricity produced on board the vehicle, in a hydrogen fuel cell stack. Electricity is generated following an electro-chemical reaction between hydrogen – which is stored at 700 bar in a purpose-designed high-pressure tank – and oxygen. The only by-product is water vapour. This electric current is channelled through an inverter to drive a powerful motor in the front of the car. The X-Trail FCV, which has been undergoing real-world trials in Japan and USA since 2006, has a top speed of 150 km/h and a range of 500 kilometres. Maximum power is 90 kW (120PS) while maximum torque is 280 Nm. It also features the latest in battery technology: a Nissan-designed compact lithium-ion battery with thin laminated cells. The Li-Ion battery is used to start the vehicle and to boost power under acceleration. Kinetic energy created under deceleration is captured and stored in the battery for future use. Still in the early stages of development, Nissan is currently working to improve durability of the FCV componentry; to find a breakthrough in hydrogen storage systems; and to reduce the cost of the technology. The company hopes to see fuel cell vehicles in series production by 2015. The X-Trail FCV is part of the Nissan Green Programme 2010, Nissan’s midterm environmental strategy which is aimed at reducing CO2 emissions from the company’s products and activities around the world, as well as reducing other exhaust emissions and increasing recycling. Other Alternative Fuel Vehicle content: here.